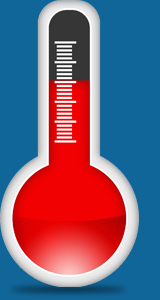 Are your products sensitive for temperature changes? We have the solution for successful cold chain management. You can easily and cost effectively monitor the cold chain of products that are sensitive for temperature changes or products that have a limited shelf life. The temperature indicators ensure that your product will keep its high and flawless quality during, and provide evidence of exposure to unacceptable temperature conditions during transport. Certain products are sensitive for high temperatures and have to be transported cool. WarmMark™ is an ascending time-temperature indicator for monitoring possible temperature changes during transport. The indicator gives exact information about temperature changes. The WarmMark™ operates very simply: if the activation window is white, there has not been a change of temperature. If the product is exposed for warmer-than-accepted conditions the irreversible red colour will start to drop in the activation window. If the temperature drops under the warmer-than-accepted conditions, the red colour won’t drop anymore in the activation window. By this method you can ensure how long your products have been exposed for warmer-than-accepted condition. 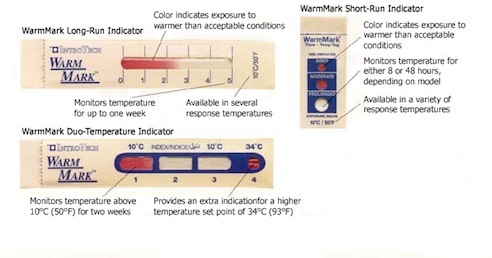 The WarmMark product family is available in several different sensitivities and run out times. Application in pharmaceutical transports, foods, vaccinations, chemicals, cosmetics, choclate, candy. Certain products cannot be exposed for cold. ColdMark™ is an descending temperature indicator. It activates on its own and indicates if the product has been exposed for temperatures below 0°C. ascends, the indicator will remain purple. Available in different temperature thresholds depending on the monitored product. ColdMark™ is easy-to-use. It can be mounted on crates, boxes or packages. The tape-protective-layer is removed and the indicator is applied inside the package. ColdMark™ confirms after the transport if the temperature has descended under the temperature threshold. ColdMark™ temperature indicators are ideal for application in pharmaceuticals industry and foods industry to ensure an unbroken cold chain.